A big “thank you” goes to Melissa Gross for inviting me (Becky) to speak at the ladies retreat October 12th and 13th at Faith Fellowship in Lucas, TX and arranging for Don to preach there on October 14th. We were so warmly received and very encouraged. After Don spoke I was approached by the adult leader for the Stars (the older girls class that meets on Wednesday night). The leader explained that her girls were studying Africa this month and would love to hear from a missionary. Of course I said yes! She was so excited and invited the others girl classes to join hers. When the leader of the boys program, Royal Rangers, heard I was coming they wanted Don to speak to the boys. So Wednesday night we were privileged to share Kenya with over 25 school age children plus adults. We gave the children bracelets made by children in Pastor Vincent’s church in Kawaida, Kenya. They were a great hit with everyone. The Kenyan children had enclosed a Bible verse with each bracelet. I was given cash from the girls in the Stars class to buy a Bible for someone in Kenya. In Don’s class a young boy gave him money from his pocket and said, “Buy someone a Bible”. It was so encouraging to know that these children are already investing their time and money to bless others and further the Gospel. Before the end of class Don asked the boys to gather around him and pray for him and the people of Kenya. He was so touched as he heard the voices of the children praying for our work and the people in Kenya. 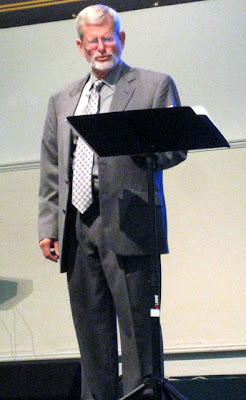 We want to thank Pastor Luke Crain for allowing us to speak to his church and the children. We honor him and his loving and generous congregation. Our prayer is that God will bless them and their children as they follow after Christ. I plan to post updates on some of the projects we did in Kenya before we left. I’m sorry for the delay! Hopefully being settled down here at the farm house I will get more reports out! Where Are Don & Becky? Yes, you read that correctly - Don & Becky are back in the States. They've been here 10 days, but in true Cameron fashion they have not been still for very long. After the long trip from Nairobi to Dallas, they arrived on Tuesday evening, October 9th, and spent the next two days dealing with things like getting their cell phones turned on, "settling" in Rockwall, and fighting the inevitable results of jet lag. They also attended the Global Advance dinner. 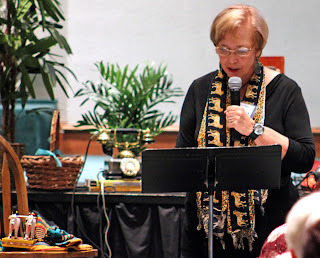 Friday and Saturday, Becky attended the fall ladies' retreat at Faith Fellowship in Lucas, Texas. I taught on the topic of God's call to serve, and Becky shared how God had called her and Don to full-time missions in Kenya and how He confirmed that calling. She also shared how God had equipped them over the past few years for full-time ministry. It was truly a blessing to be able to share time with her, and each of the ladies at the retreat was blessed by her testimonies. On Sunday, Don & Becky were at our church to minister again, this time Don spoke at our morning worship service. He shared about the work they are doing in Kenya and how they provide physical and spiritual food in order to share the love of Christ. After we feasted on Mexican food for lunch, they headed out to pack once again. Monday morning, they were back at DFW on their way to Louisville, Kentucky, for the Kingsway Fellowship Convention. They actually spent several extra hours at the airport since their 6 am flight was cancelled and they had to wait until 12:30 to head out. They've spent the past four days at the convention in Kentucky and will arrive back in Dallas today! So, now you can understand why you might not have seen or heard from Don & Becky just yet. Fortunately for us, they will be in the States until the end of the year, so there will be many opportunities to visit and reconnect! 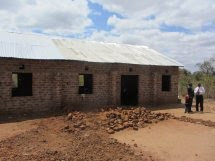 We are glad to report that the roof of the church pastored by Peter Mbiti is complete. The roof of Pastor Ambrose Wingi's church should be completed this next week. As sometimes happens, things do not go as planned. 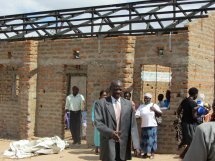 Pastor Ambrose's roof was to be completed BEFORE our Revelation seminar in September. However, we were able to "make do" with tarps provided by church members. Thankfully it didn't rain during the day so it was fine. We were so blessed by those who God prompted to give. We are amazed how He does it. Over half of the cost for this project came through special gifts. We are thankful that God hears the prayers of his people! Please continue to pray for us as we are returning to Texas until the first of January. We look forward to seeing family and friends and sharing what God is doing here in Kenya!